Confidence is a funny thing. When you’ve got it, you feel like nothing could get in your way. You could stand up to that old bully from middle school if you crossed paths with one another, just like you could give a speech in front of hundreds about any given topic — when you are full of confidence, that is. It must be said, though, that none of us are born with a limitless amount of self-confidence. The point is this: any number of experiences or interactions might have contributed to a lack of self-confidence. Some might call it self-esteem, self-worth, or even self-efficacy, but the common denominator here is that, when you don’t have it, life can be pretty difficult to navigate — socially, personally, and professionally. Self-Help From A Grand Rapids Outdoor Activity Park? That’s why we’d like to take the opportunity to offer up a few tips to help boost our readers’ self-confidence! We aren’t psychologists, we at TreeRunner Grand Rapids Adventure Park are people who want to do everything we can to help those with whom we interact. To be fair, most people don’t associate going to a treetop adventure park with any kind of “self-help,” but then again, our aerial adventure park isn’t your average activity! 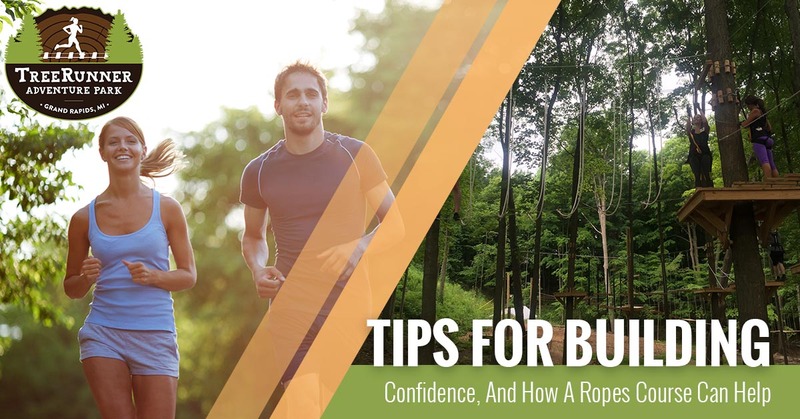 So read on if you’d like to learn a little bit about how you can build your confidence, all while we tell you about how our series of zip-lines, ropes courses, and obstacle courses might help you conquer some of those inhibitions that have been holding you back! When Ralph Waldo speaks, we should all listen. He’s right as well: there will always be doubters and nay-sayers, no matter which course you set off on. But you can’t focus on the negativity. Instead, try affirming yourself by verbally stating positive facts about yourself. It might sound a little funny and feel a bit awkward at first, but there’s genuine power in speaking truth over yourself. The fact is, just because it’s cheesy doesn’t make it untrue! So here’s some more cheese for you: no one will believe in you unless you believe in yourself! We are all insecure. We are all insecure because, in part, we assume that everyone will notice our insufficiencies the moment they surface. But the reality is that most of us are too busy obsessing over our own insecurities to notice one another’s. And there’s some sort of tragic comfort in that fact. If we only realized that we are almost always our harshest critic. That person who said those horrible things to your face in high school? They don’t even remember your name, let alone what they said to you all those years ago! Letting those words from the past impact how you view yourself in the present has to be dealt with. As Louise L. Hay recommends, give approving of yourself a try and see how it goes. Affirm yourself in word and action, and you just might be able to shake off all that negativity from the past! As we said above, we aren’t therapists — not by any stretch of the imagination. But we do believe in always challenging yourself. There’s a lot to be gained by going out of your comfort zone. While it certainly looks like different things for each of us, many of us have inhibitions about physical activity, heights, and generally trying activities that might viscerally scare us. If you live in or near Grand Rapids, it just so happens that we might have just the ticket for challenging and empowering yourself — our aerial adventure park at TreeRunner Grand Rapids Adventure Park! It’s the premier aerial adventure park in West Michigan, featuring over 70 exciting zip lines and obstacles. Complete with three different difficulty levels, your baseline skill level doesn’t matter — you are sure to have a blast while challenging yourself in the trees! And we will warrant without question that our aerial adventure park isn’t the complete solution to any kind of self-esteem issues. However, it might be a great place to start if you are looking to get to know yourself a little bit better. It might make you come alive in a way you never realized is possible! We have the pleasure of welcoming guests young and old, many of whom are surprised by how much fun they have! We are located at East Beltline and Knapp corner behind Celebration Cinema North. Whether you are looking for a great time with the family, or you feel like challenging yourself in a new way on your own, we are confident you’ll have a blast at our treetop adventure park. Come visit us and get ready for an adventure unlike any other! Book now! We’d love to have you try it out for yourself.